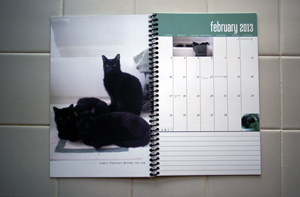 We kitties do not need planners or calendars. But our humans do. Are your humans still looking for a 2013 calendar? Read on. 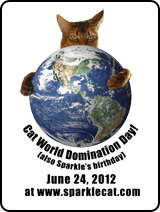 We were recently contacted by animal artist Bernadette Kazmarski, whose blog, The Creative Cat, I’m sure all of you know. If for some reason you don’t, I urge you to visit her website. Bernadette is a multi-talented artist and an animal lover. My human and I enjoy the many ways she shares her passions on her website: from pictures of the members of her extended family of furry friends, to beautiful paintings, drawings, sketches of kitties (hers and others’), to beautifully written stories of rescued kitties, there is always something funny, moving, or inspiring (usually a combination of the three) to enjoy at her place on the Internet. So we were thrilled and honored when she contacted us (really me, Texas) to ask if we would be interested in reviewing her 2013 calendars: In the Kitchen with Cookie & Compositions in Black and Green. Compositions in Black and Green will be sure to meet your daily needs for mischievous kitty prowesses: playing in their human’s bathroom, offering their both cute and majestic mirror reflection to the artist’s camera. Each month offers wonderful and funny pictures of Bernadette’s five black cats in front of the white and green theme of the artist’s kitties’ bathroom. Mimi, Mewsette, Jelly Bean, Mr. Sunshine and Giuseppe Basil Verdi will assuredly help you start each day of 2013 on the right paw. It will also help you see black cats in a whole new color. In the Kitchen with Cookie will bring you an assistant chef in form of a calendar. When your name is Cookie, you make it a point to wear your colors (especially when they are tortoiseshell) proudly and that surely gives you a licence to spend more time than any kitty can dream of spending in the kitchen. This calendar is an adorably sweet (and savory) mix of beautiful pictures of Cookie and related (to Cookie’s postures) recipes from the artist. Evidently, Bernadette and Cookie formed a great team in the kitchen. I tried to convince my human to try the cheesecake recipe (especially since Cookie seemed to require that kitties test the filling) but my human is on a diet too! She preciously kept the recipe though. Both calendars allow for you to input important appointments and some notes. Yet they are small enough to fit in a hand bag if necessary. They both exist bound either on the top (as a wall calendar) or to the left (as a journal calendar). My human had a preference for the journal calendar, but it all depends how you expect to use it. Both versions of both calendars can be ordered here. Bernadette has kindly offered to giveaway one copy of In the Kitchen with Cookie (wall calendar) and of Compositions in Black and Green (journal calendar). To win a copy, please leave a comment telling us which calendar you prefer and why. Don’t forget to leave your email so I can contact you if you win. You have until Saturday, Jan. 26, 9.00 pm EST. A random drawing will give us the two winners, that I will announce on Sunday.